Two ultra-Orthodox men who attacked police officers as they tried to rescue a haredi soldier in the Mea Shearim neighborhood in Jerusalem were charged Friday morning with aggravated assault of a police officer, disturbing a police officer in the line of duty and rioting. The Jerusalem district attorney sought to extend the detention of the two men, Joseph Brown (22) and Jacob Krichevsky (21), until the end of proceedings. Police will also prosecute two other detainees, who have not been charged with assault. According to the indictment submitted to the Jerusalem Magistrate's Court, on Tuesday at about 7 pm, A., a soldier, went to visit his uncle who lives in the neighborhood of Mea Shearim in Jerusalem. The soldier arrived in the neighborhood dressed in a military uniform and wearing a yarmulke. 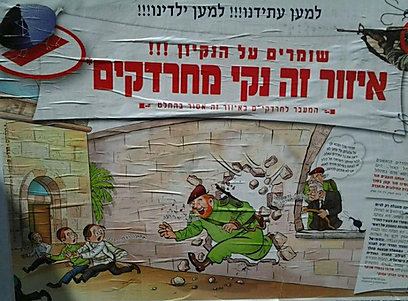 As he walked through the neighborhood, passersby yelled at him, calling him “Hardak (frivolous haredi)” and shouting at him to "Go away." About 50 meters from his uncle’s office, a bag of trash was thrown on the soldier. The soldier, who noticed a crowd gathering around him, fled to the office of his uncle. He locked himself inside with his relative and called police, who came to rescue him. With the arrival of the police, the indictment said, many people had started to congregate, among them the two defendants, who threw rocks, iron bars, chairs and buckets of water at the police officers. At this point, police officer Meir Amrani told the haredim to disperse as it was an unlawful gathering, but rioters, including the two defendants, remained at the location. The indictment also said that during the attempt to disperse the rioters, Brown threw bottles and stones at police. Two policemen grabbed the defendant and told him he was under arrest, but he tried to evade them. On the way to the police cruiser, Brown asked friends to help him escape the police, and he even tried to escape himself by grabbing the hands of his friends. Krichevsky, according to the indictment, threw stones, pieces of metal and glass bottles at police who were working at the scene. Some of the stones and bars hit police officer Gal Attia, who had approached the defendant's direction. Two police officers arrested him and then he became even more agitated, kicked at officers, and spit on them. "With these actions," the indictment says, "the defendants congregated with others, with a common purpose and violated the peace in a manner that threatened the public. The defendants also attacked police with objects with the intention of obstructing police from carrying out their duties. Also they acted intentionally to interfere with the police." The request to hold the two defendants until the end of proceedings said among other things that "the gravity of the offenses attributed to them and the circumstances of the execution establish reasonable grounds for concern that the release of defendants would endanger public or national security, and thus the conclusion is reached that there are no real alternatives to detention." 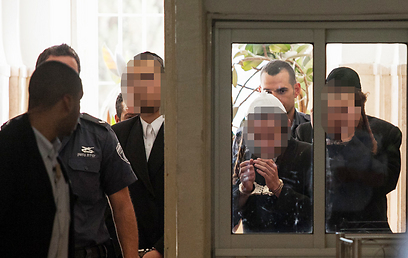 See all talkbacks "Indictment: Iron bars thrown at police who rescue haredi soldier"